Reasons for concern: This plant contains allelopathic (toxic) properties and can quickly form a monoculture in disturbed areas by outcompeting natives. This reduces native plant diversity and important wildlife habitat. It becomes a tumbleweed allowing seeds to spread far and wide. When dry it can be a fire hazard. Botanical description: Pyramid-shaped, broadleaf herbaceous plant. Leaves: Seedling leaves silvery-green, soft, and fuzzy. Adult leaves green, narrow, lanced-shaped, and alternate on stem, 1 to 2 inches long. Leaves red-tinged or red, depending on maturity. Stems: 1 to 6 feet tall. Slender stems upright and spreading, with many branches. Stem green or reddish, often with red stripes. Flowers: Tiny and greenish, growing in clusters where leaves meets stem and at tip of stem. Flowers have no petals and are difficult to see. Blooms from July through October. Seeds: Produced from mid-summer until first hard frost. Roots: Taproot can grow down 16 feet. Native to: Asia, introduced to Europe, then to U.S. as an ornamental. Where it grows: Roadsides, rangelands, fields, disturbed sites. Tolerates poor, salty soils, drought conditions. Elevations 2,500 to 8,000 feet. Life cycle: Annual. 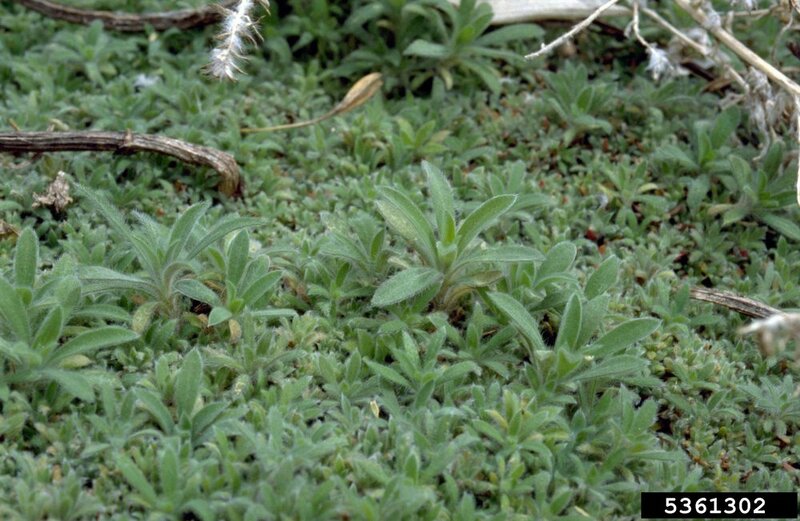 When the seedlings germinate, infestations appear as a gray-green mat. Kochia seeds generally germinate throughout the growing season, beginning in March on through late summer. Weedy characteristics: Seeds scatter as the mature plant breaks off and tumbles in the wind. Each plant typically produces around 14,000 seeds per plant, of which five percent are viable after one year. 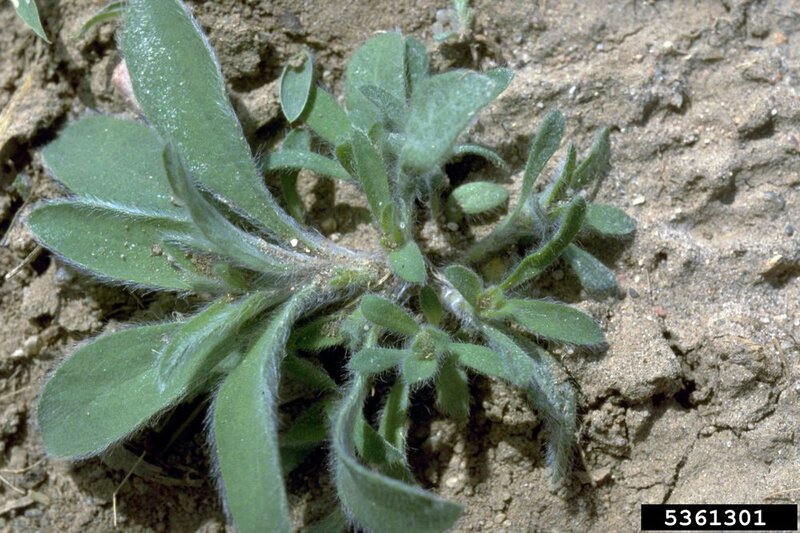 Kochia produces allelopathic (toxic) chemicals that discourage the growth and germination of other more desirable plants. It spreads very quickly, invades agricultural, public, and private lands, and creates a fire hazard. Control strategies: Seeds germinate profusely very early in spring at temperatures above 40 degrees. When seedlings germinate, infestations appear as a gray-green, fuzzy mat. Seedlings compete with each other for water, sun, and nutrients, and many die off naturally. The best time to hand pull them is when they have thinned out and are a few inches tall. It is also an option in large infestations to mow them before they flower or go to seed; the mowing must be repeated until the plants are dormant and no longer producing seeds. Pulling mature plants is difficult, as they are deeply rooted. Try to remove all the Kochia before they get large. Using a shovel will disturb the soil, encouraging the growth of other invasives. Be sure to step down any loose soil. Plant desirable species to outcompete invasives. Monitor previous infestations often for new growth.